It’s the last day of my four day staycation. I’ve been busy whipping up some new dresses (Stylish Dress Book 2), finishing off some old projects (roman shade for the kitchen, watching girlie movies (What Happens in Vegas) and eating lots of candy (wine gums). Back when Etsy came to Toronto, they asked if I would be interested in doing a Canada Day feature for them. I was totally honoured and overwhelmed. I didn’t realize just how hard it would be to narrow down my favourites to just twelve! It really made me realize how much incredible talent there is here in Canada. Seriously, you guys blow my mind almost every day. 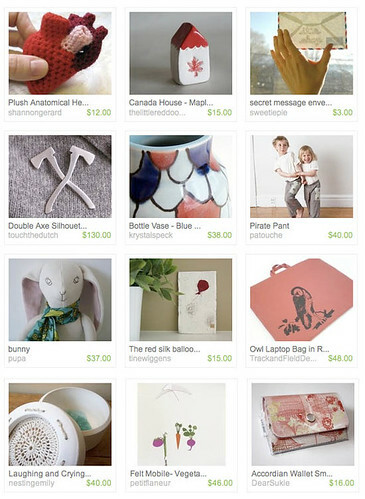 You can see my little feature on Etsy here. Happy Canada Day, everybody. I hope you had a lovely holiday. Tomorrow, I’m officially back to work – which luckily happens to be one of the best jobs in the world. and i have to agree, you are cool. I’ve been meaning to write to ask if The Workroom could offer a roman shade-making class?